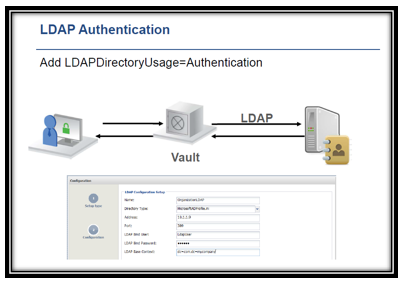 Enterprise Vault Server lockdown – only allows RDP from preconfigured IP’s. Any external components to be used should be manually allowed in the vault. Vault administration activities can be done through – PrivateArk Client, or Remote-Control Agent. 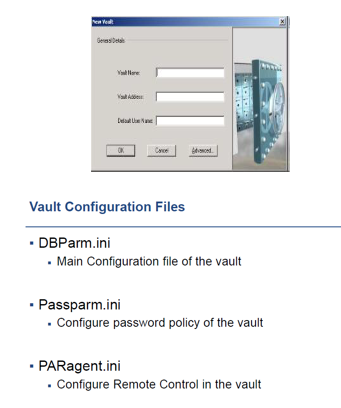 Vault Configuration options are setup in some critical files on vault. Operator keys are required for vault to start/restart. Master keys are required for vault to be restored. In the Identity Management safe’s Password & Other object are stored within SAFE’s. And the Safe sets & restricts are accessed to objects in CyberArk – with fine grained access options. Objects and related metadata are stored in the same Safe. 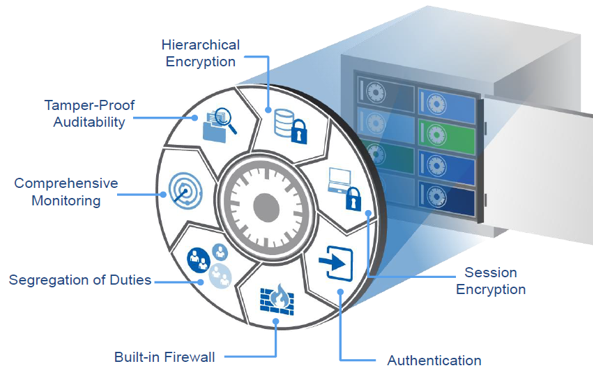 Internal safes exist for access to objects for CyberArk functionality: vault administrators have access for these safes. Other access setup is done either from PVWA or PrivateArk Client. Access setup on each SAFE as access list. Platforms specified during Password addition controls: Password change frequency, notification settings, etc. Platform settings should be set to match rules on the remote machine for password complexity. Predefined platform settings are available for accounts types to be managed and can be edited. Platform Settings can be customized for Workflows & Automatic Account management rules. 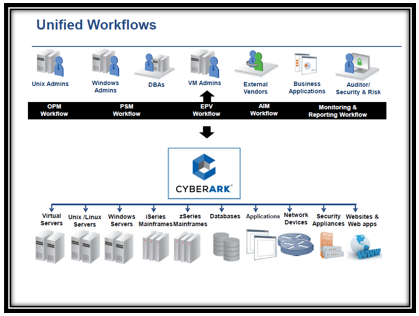 More can be added through support packages made available by CyberArk. 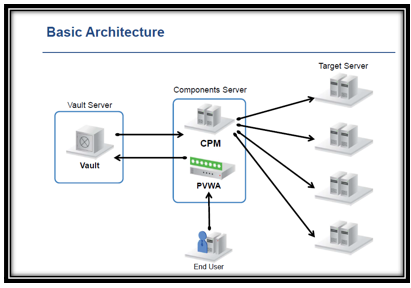 Policy is defined configured from PVWA and stored in Vault. 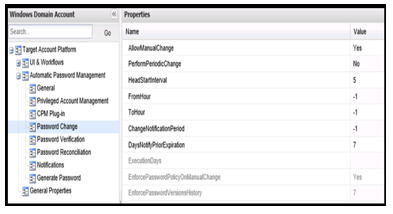 Master Policy is created for managing accounts to meet enterprise password rules. Policy has basic rules (account management, session monitoring, auditing and access workflow). Some basic rules have associated advanced options. Specific Platform related rules are set through exceptions to customize how to manage a password based on environment. 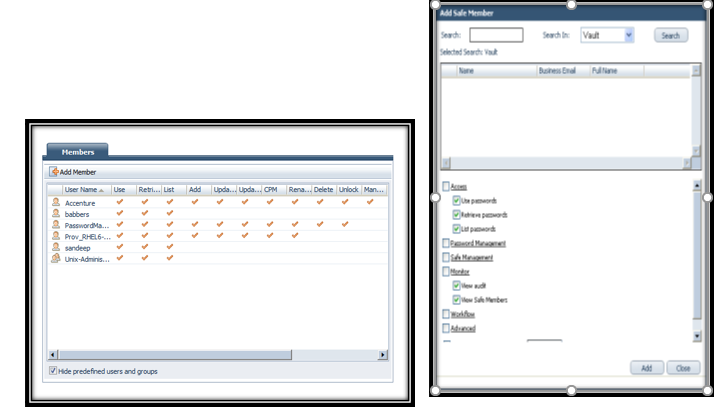 Password Vault Web Access provides a web interface. Enables users to easily perform: privileged passwords addition, setup access, perform audit, extract reports, vault admin, configuration functions. Powerful search mechanism enables to find privileged passwords and sensitive files easily. 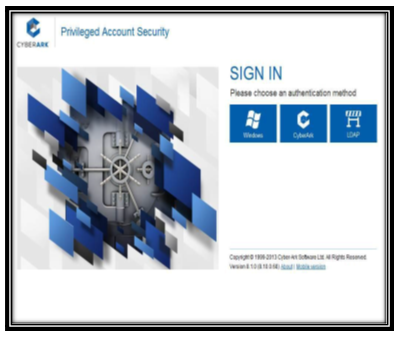 Dashboard provides an overview of privileged account security solution and statistics.